The 4 and 5 keys in the left-most column are used for subtraction using the "nines-complement" method. 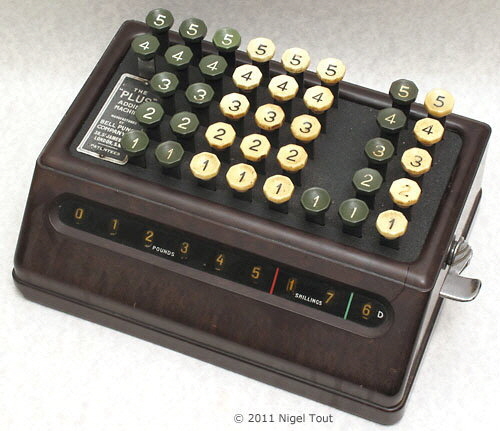 The design for the first Bell Punch mechanical calculators, the Plus Adders (see photograph below), was bought from Petters Ltd. of Yeovil, Somerset, the well known manufacturers of oil engines and the company from which Westland Helicopters derived. The book "The Story of Petters Limited", by Percival Petter, written in 1933, gives the information that Guy Petter, of the Petter family, had been developing a calculator and in 1927 moved to the Petters Yeovil factory to work on it full time. Development of a satisfactory mechanism proved much more difficult than anticipated but by the time the history was written, in 1933, it was ready for manufacture under the name "Petometer". 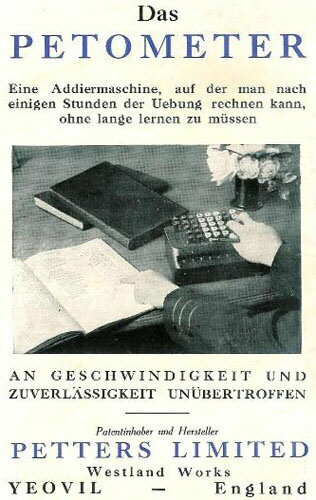 An advertising brochure for the Petometer in German (scan kindly supplied by Wilfried Denz who has a website featuring old calculators at http://www.rechnen-ohne-strom.de/). "An adding machine, on which you can count after a few hours of exercise, without the need for extended learning." "Unbeaten on speed and reliability." In 1936 the design of the Petometer was bought by Bell Punch who launched it as the "Plus Adder" or "Plus Minor". The Plus Minor is listed in the book "Die Rechenmaschinen", published in Germany about 1937, so Bell Punch rapidly got the calculator into production. There is a Petometer adding machine illustrated on the 'Westland 100 Years of History' website. This looks like a development of the machine shown above in the brochure, and is very similar to the Plus Adder B (shown below and with a page on this site) except for the label which shows "Petometer (Petters Patent)" and "Manufactured by Petters Ltd., Yeovil, England". The Plus Adder B from the Bell Punch Co. is very similar to a version of the Petometer from which it is derived. 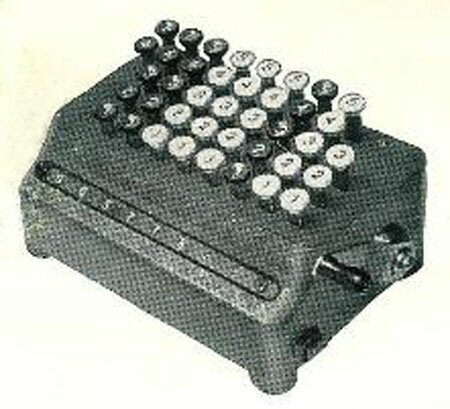 The German typewriter and calculator manufaturer Torpedo-Werke, of Frankfurt, also obtained a license and produced rapid adders or "Schnell Addiermaschine" similar to the early Plus Adders. Petter, Percival, (1989) "The Story of Petters Limited", Westbury, published by David W. Edgingyon, ISBN 0 906558 02 6. Martin, Ernst, (reprint of 1925, with update, edition) "Die Rechenmaschinen und ihre Entwicklungsgeschichte", Leopoldshöhe, Verlagsbuchhandlung B. Köntopp.